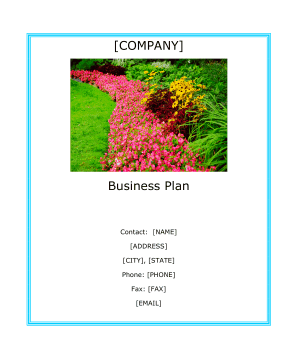 This is a free, printable financial and strategy business plan to guide the new and growing enterprises that provide landscaping services for corporations and private residences. [COMPANY] will sell landscape supply products to both residential and commercial customers. Additionally, the Company will also provide installation, maintenance and warranty services. ?The owner of [COMPANY] is [NAME], who has extensive experience in the landscape supply and service industry. [COMPANY] is to be headquartered in the rural area of [CITY], [STATE] just outside city limits with the nearest town approximately 6 miles away and its closest competition located 40 to 50 miles away. ?The Company prides itself on the quality of service, knowledge and expertise in this Business. [COMPANY] is seeking $1,500,000 in grant funding for the startup of this Business. [COMPANY] will be a boulder cutting operation and landscape supply Company in which it will manufacture and sell large boulders. The Company will sell to the entire State of [STATE] with potential customers to include new and existing homeowners, landscapers, commercial and residential excavators, and commercial clients. With the management team already running an excavating business, an overflow of customers for the Company is expected. Boulder cutting is in very high demand and currently the only other business that supplies these boulders are delayed with their orders at least 4 weeks. Boulders, which can be described as large rocks sometimes as big as a small car, are cut with a rock saw and used to landscape in a variety of ways. [COMPANY]'s competitive edge is a combination of the unique product, interaction with clients and experience in the field. The cut boulders are not only a rare or unique but it is a "Green" product that provides options for many potential customers in the community. By providing clients an education on the services the Company provides, this builds relationships of trust and satisfaction. Clients will come to depend on the unique product and services. Based on the detailed financial projections, [COMPANY]'s future sales for 2010, 2011 and 2012 are expected to be $300,000, $800,000 and $1,000,000, respectively. [COMPANY]'s mission is to provide the [STATE] community with unparalleled customer service, reliable and quality product, and to stimulate the local economy by bringing employment opportunities to a rural area. Reliability: of the products and services the Company offers. Customer Satisfaction: superior customer service. Quality of Experience: knowledge and reputation in this Business. Location: the Company is located in a Central area which is not only convenient for customers but also handicap accessible. [COMPANY] is a Limited Liability Company?100% owned by [NAME], the Manager and Operator of the Business. Start-up costs total $1,457,117, which is primarily building and equipment costs.? The assumptions are shown in the following table and chart.